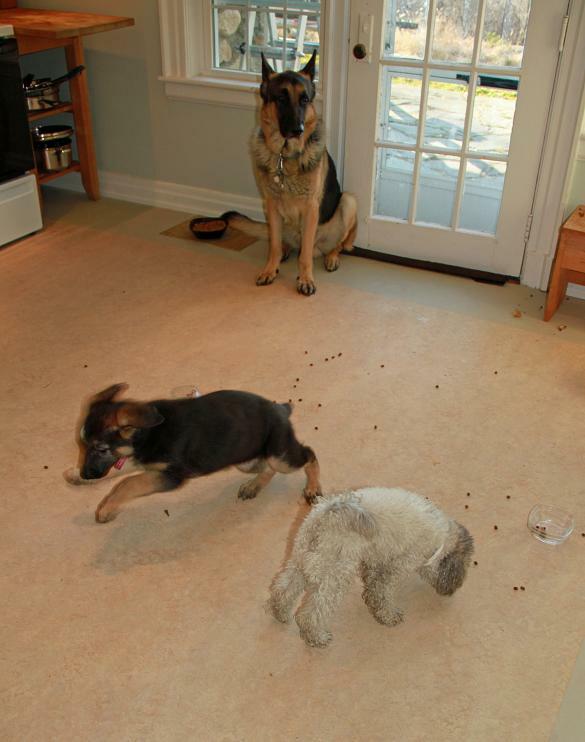 This is the continuation of the 2010 Sassy & Marcus Litter blog. I thought that since we converted the whelping room into a play room… the puppies turned 1 month old… they are now eating completely on their own and running around like little raccoons… it was time to start a new page. 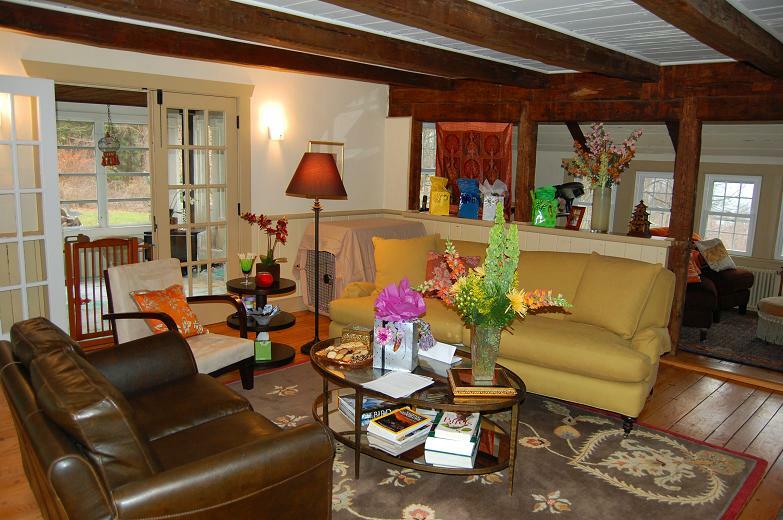 Just one big open, puppy-proof space to run around, discover toys, wrestle with a sibling, and crash. They no longer need the whelping box. 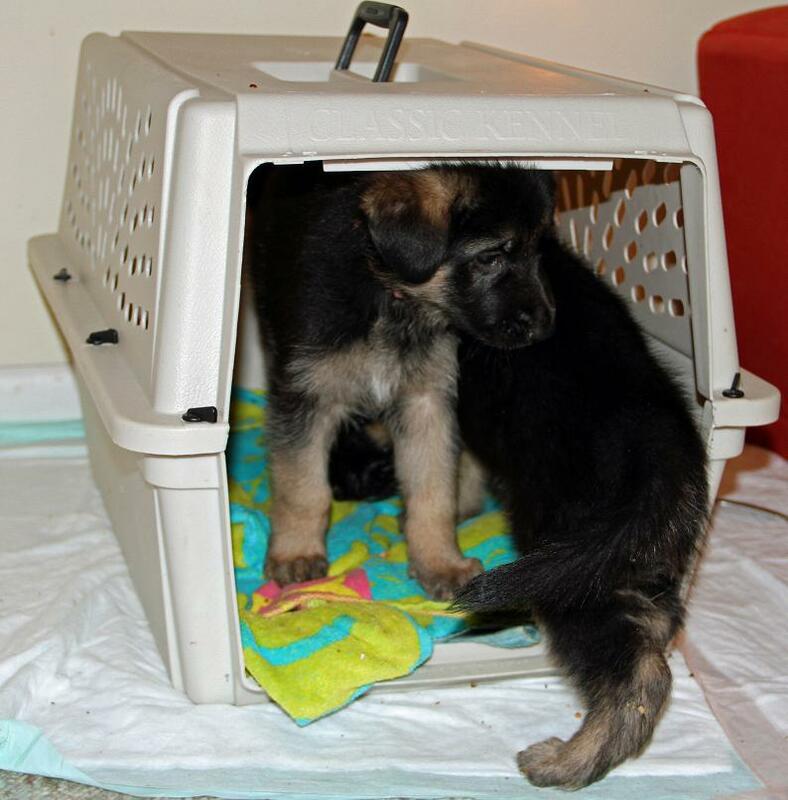 We have also introduced some crates/carriers with blankets, which they love. We removed the doors from the crates, and they just go right in and sleep in there, like a den. We never put them in there or showed them how. I guess they just feel safe in them. There were apparently 4 sleeping together in one last night! Personalities are getting more distinct! I know I’ve posted before about them, and without reading what I’ve previously written, here is what we are now observing. I’m wondering if it meshes with what we’ve seen all along, or if their personalities are evolving. 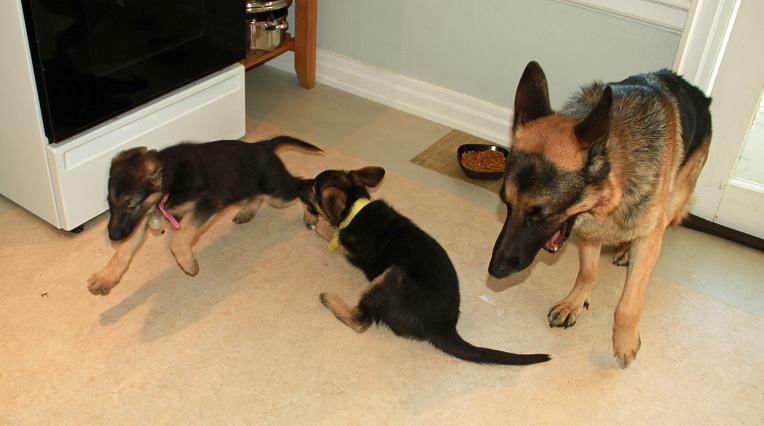 Greenbean Wants to be the boss / alpha puppy. 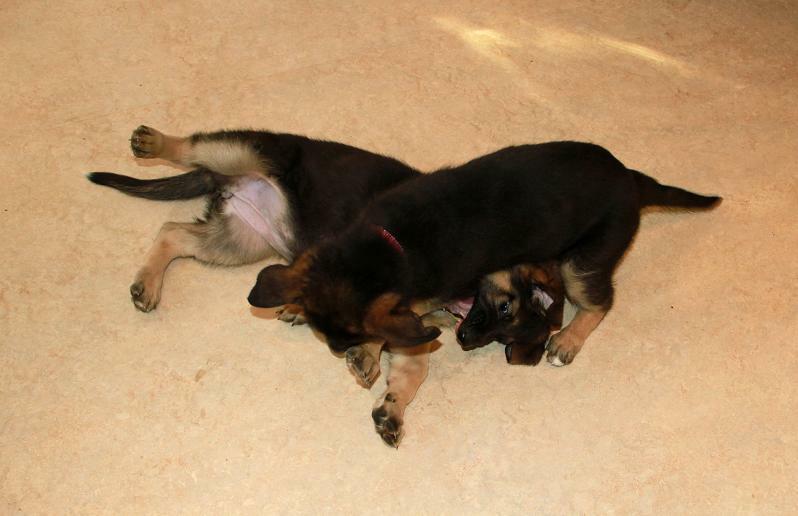 Always wrestling and instigating a tussle to show his siblings who is in charge and the strongest. Huge appetite. Will eat twice as long as others, and his weight shows it! Also seems to have the most energy, running around long after the others have curled up for their postprandial siesta. 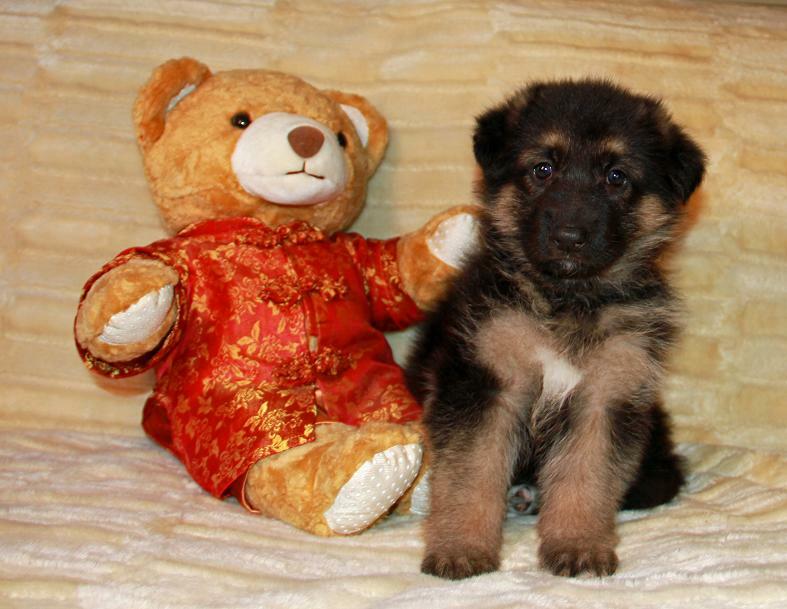 Forget about the house, this guy will probably grow up to guard your neighborhood. Bluebeard and Rosie Similar personalities, and often together… on a lap. Most attached to people and Sassy. Love interacting with humans and each other. If a person is in the room, they are most likely trying to climb up on her, or snuggling up close. Bluebeard is Mr. Whineypants, by far the most vocal – whines, growls, yaps, howls, he does it all. He remains the apple of my eye. Violet Most independent and first to explore new things, curious, very intelligent, unafraid of anything new; does not show fear like typical puppy might of something new and potentially “scary,” but instead, curiosity and will approach. Often off doing her own smart/exploratory thing. Needs less attention; confident and sure of herself. True to a first-born! Also the quietest – almost never makes a sound. Lemondrop A true charmer, natural born show-stopper, a funny, pretty doll. She is our Hollywood starlet. We all can’t get over how gorgeous her little face it. We think she wins the award for looks. I’ll have to post a recent close-up of her face. 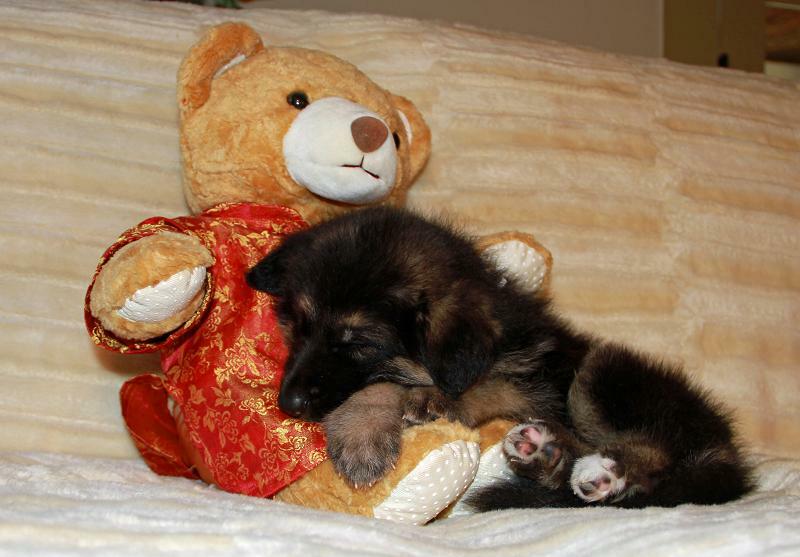 A cuddler, but will also curl up on her own when she gets tired; does not need to be with the group all the time. Always doing silly things, too. Below is an un-posed picture – she did this all by herself, and it’s a perfect example of how she’s always making us laugh out loud. 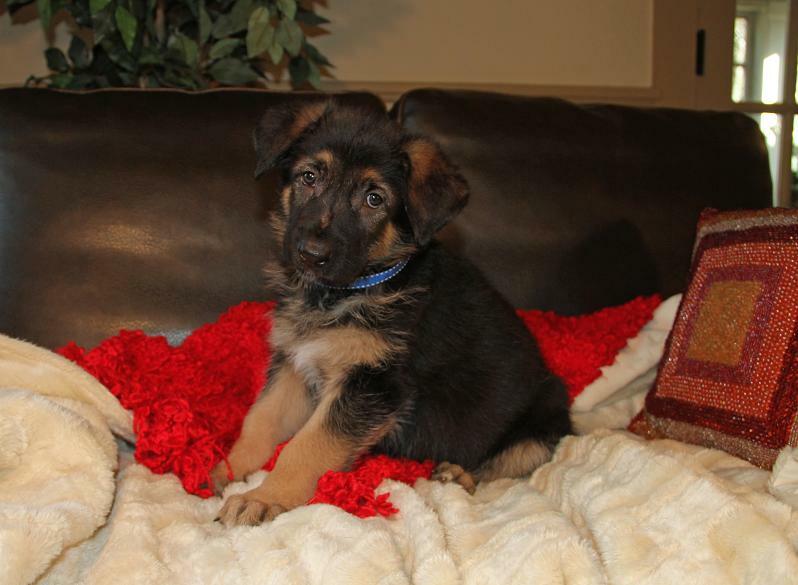 Blanche – fluffy, sweet girl! She has the longest hair of all the puppies, and will definitely not be a short-haired dog. We can’t tell if some of the dogs are “fluffies,” and she is a true long-hair, or if she is the only “fluffy.” In any case, her coloring is to die for. I think she is Dave’s favorite. A very mellow, good natured girl, and seems to be everyone’s favorite wrestling partner. They all want to play with Blanche! Always quick to give you a big kiss on the chin. Just a ball of love. 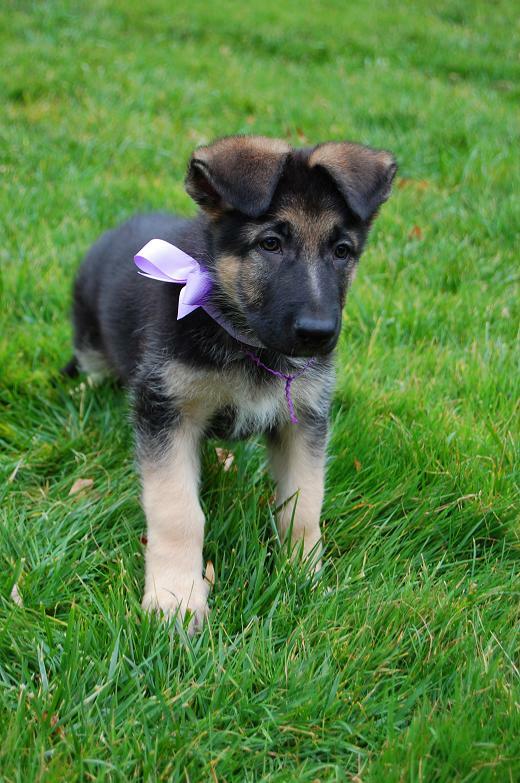 Walking Blanche will probably be like walking Sassy – you can’t go 10 feet without someone stopping you and exclaiming – “Oh my G-d, what a gorgeous Shepherd! Where did you get her? 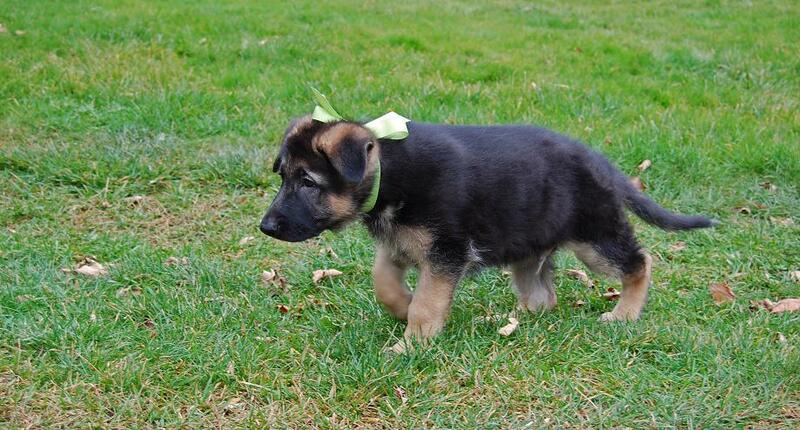 I didn’t know German Shepherds could have long hair! How old is she?” etc., etc. If you adopt Blanche, be prepared to meet perfect strangers who can’t get over your dog’s looks. November 1 – Eating Fun! 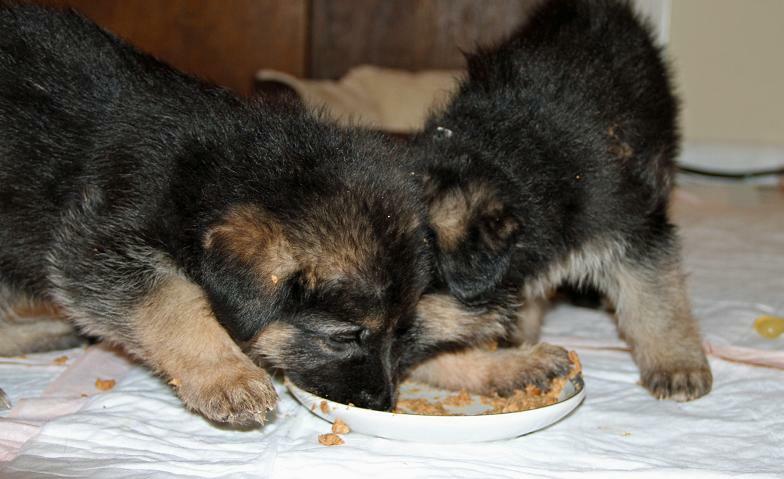 The puppies dive into their meals… you guessed it, literally. 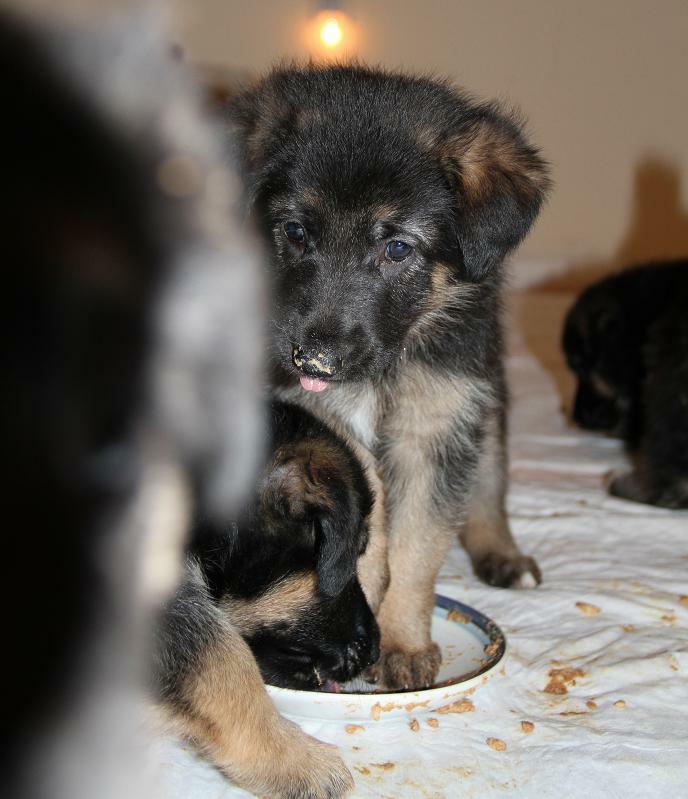 There is something unusual in the way 3 puppies are eating here — check out the last 3 pictures of Lemondrop, Bluebeard and Blanche… they are eating lying down, highly unusual, and just like the way their mom eats! Is the propensity to eat lying down genetic?? 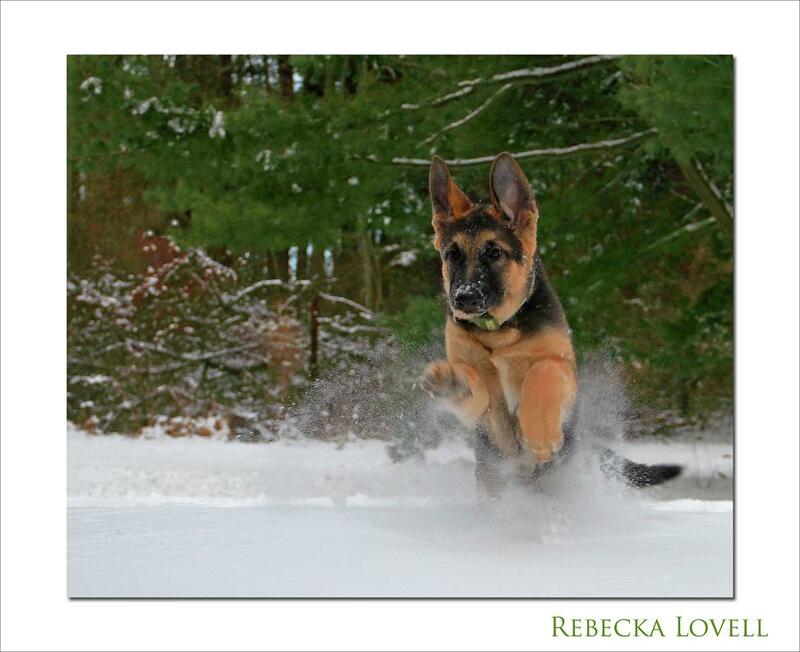 And… look at the classic German Shepherd stance that Rosie assumes naturally while drinking. Trainers go to great lengths to “stack” German Shepherds like this at shows, with one rear leg stretched behind the dog. 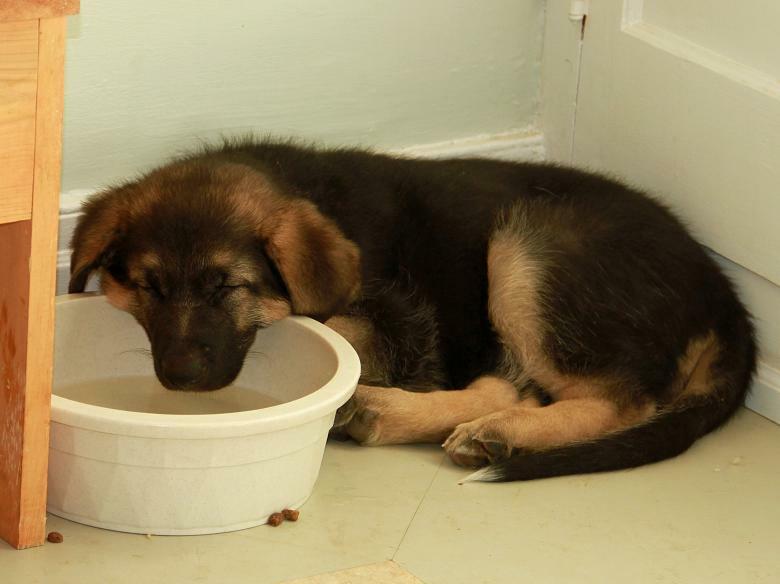 It’s a great sign of proper build that a puppy does this naturally! 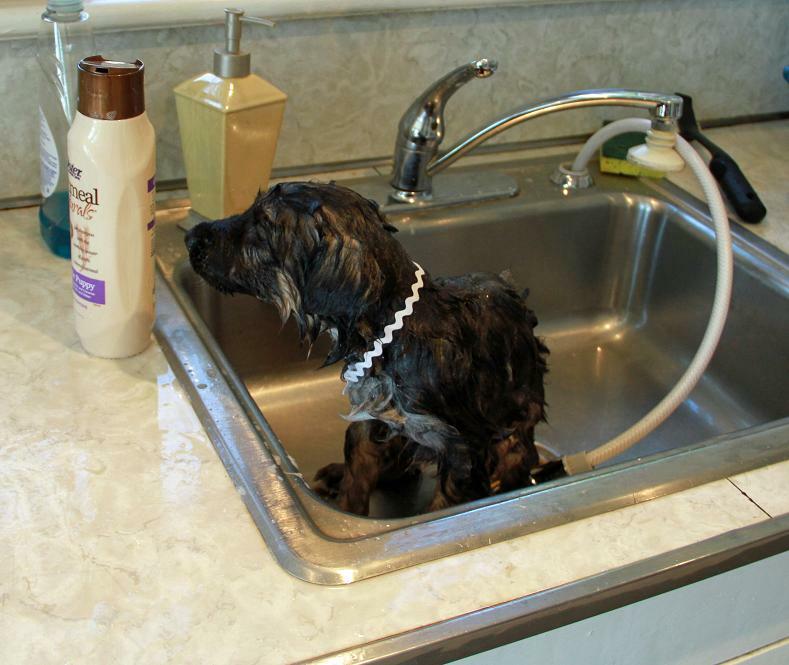 Blanche gets a life lesson: Some days are better than others. It was worth it to get your portrait done, though, right?? Jane, our overseeing breeder, came to see and evaluate the puppies yesterday. I have to say, I was nervous! Jane has so many years of experience breeding Shepherds. (This is our first and probably last time.) Would Jane approve of what we had done, how we had set everything up, how the puppies looked… etc.? Yes, we have met many times, and she has been in contact with me via email and phone about raising the puppies every step of the way (patiently answering countless questions), but she was here to evaluate the puppies and… yikes, us, as breeders. Everyone who knows her also knows how high she maintains the bar for her own breeding operation. I am happy to report that she was pleased with what she saw. 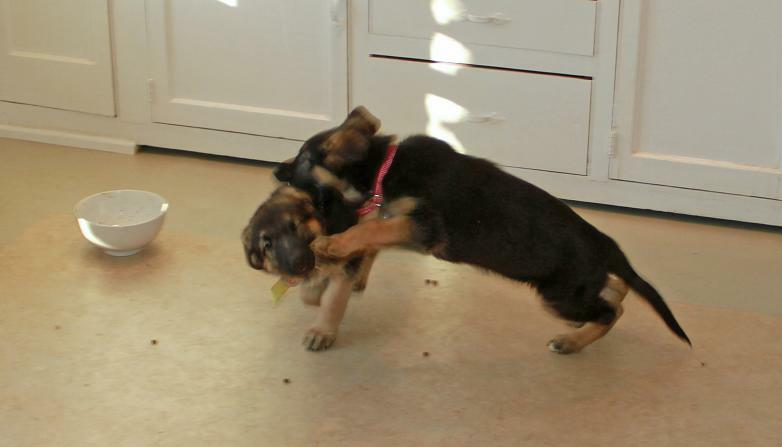 The puppies, as they always are when we visit them in their playroom, were outgoing, friendly, curious, funny, and not obnoxious like I’m sure many litters are. I’m so glad Jane could tell how much they have been socialized. 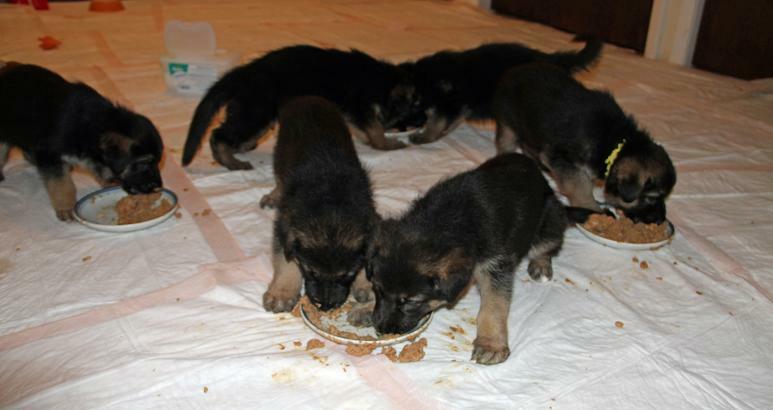 We have four shifts each day, 8-12-4-8, when the puppies are fed, their room is entirely cleaned, and each puppy is examined. 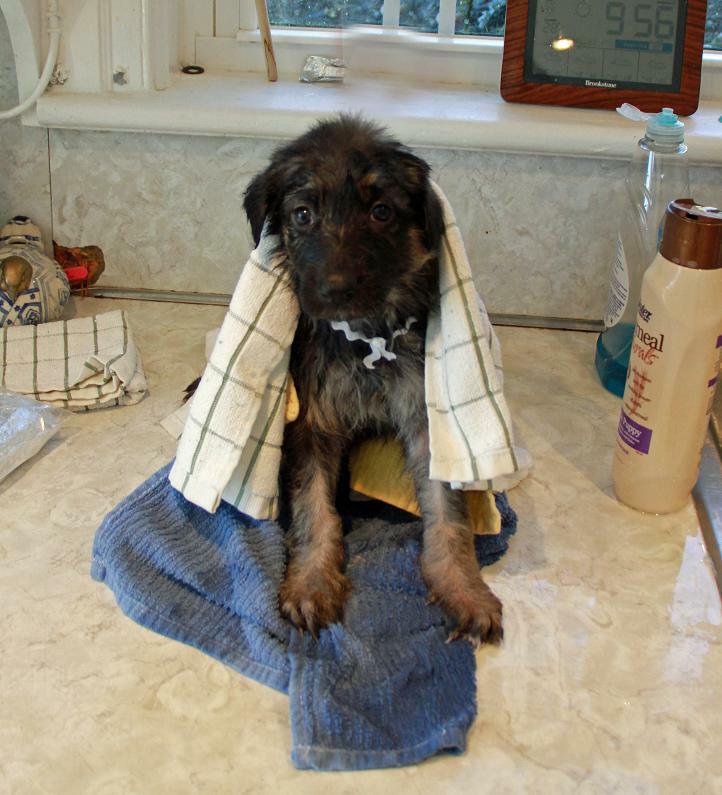 If the pup has, for example, walked through her food dish (not a rare happening in the puppy world), the pup gets her act cleaned up immediately. They never get and stay dirty. 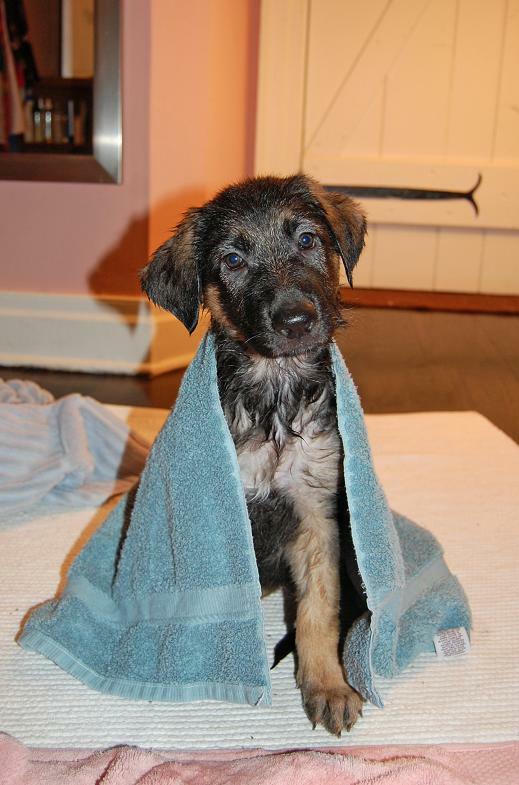 And since there are four of us working to care for the pups, we each take one shift, and it works out perfectly. What this means is — each one of us four only “has” to go over there once a day and work. So we don’t feel pressured that we have too much to do… which means we are all always going to see them, just to play with them! They are so much fun. It doesn’t matter what is going on in your life: when you step into a room with six beautiful, perfect, playful puppies, your day magically turns into a good one. I am really, really going to miss having them around. I realize, though, that there are wonderful families waiting for them, and that really makes me happy. 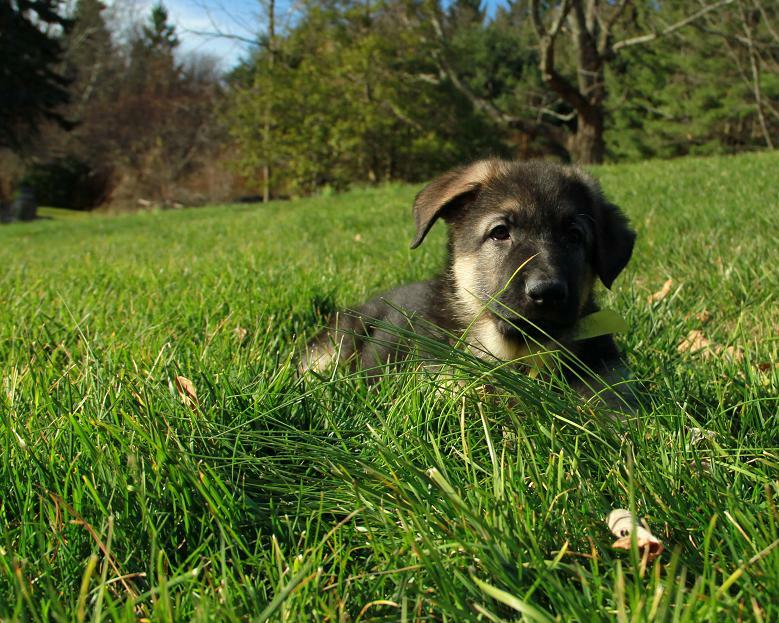 Six different families will be getting everything a dog brings to us humans — love, companionship, devotion, and in the case of GSDs — protection. A dog I helped raise so lovingly from birth! Without getting all sentimental, I will say that I feel blessed to have been able to participate in this wonderful cycle. I feel a true sense of satisfaction in providing these dogs to others. They have been raised from birth as I would have wanted a dog of my own to be raised. In fact, one of them may be staying. Rosie. 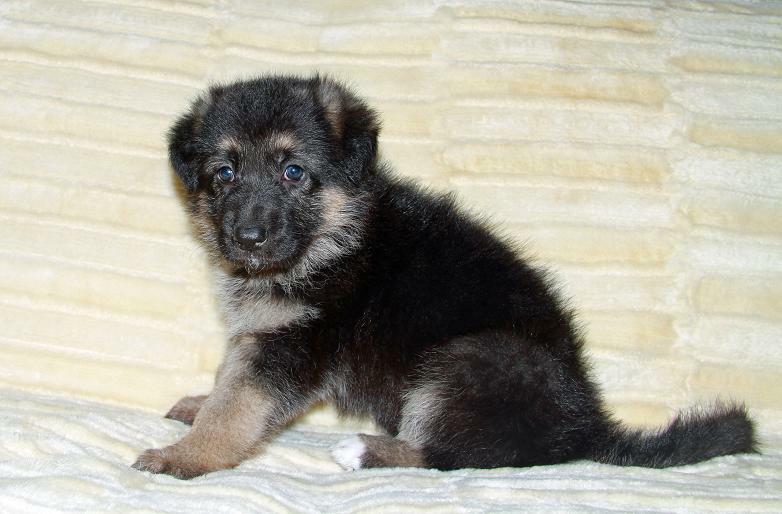 A certain person who shall remain nameless has fallen in love with her, and she may become our dog. At the very least, he is getting the strong feeling that if she is not our dog to keep, he should personally be the one to place her in the home of someone he knows. It’s like — she has somewhere to go, and only he knows where that is. So, under the contract, he gets to choose one, and Rosie it is. Funny how he knew this as soon as she was born, and never waivered — she was his special puppy to oversee, in some important way. Oh – almost forgot to mention. When Jane was here, she checked the two boys out. The special “items” that needed to descend have descended, and both have a complete set. Go boys! Greenbean was very good for her, and let her examine him without a problem. It doesn’t hurt, after all. Bluebeard, however, was another story. What a character. For whatever reason, he just did not want her to look at him! He kept squirming out of her arms and running away, making pathetic puppy squeals the whole time. Mr. Whineypants strikes again. So we would wait ten minutes, and try again. Same thing. We ended up having to “trap” him (lol!) and bring him over to her, and finally, on the fourth try, she was able to see that he was a “complete” male. 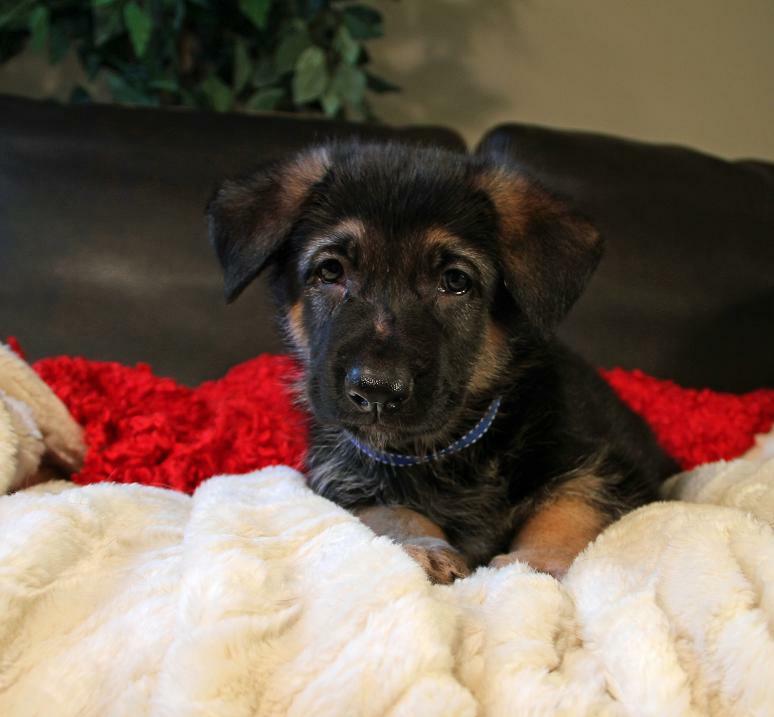 I took Bluebeard at 6 Weeks portraits (below) and will be doing so for all the puppies. 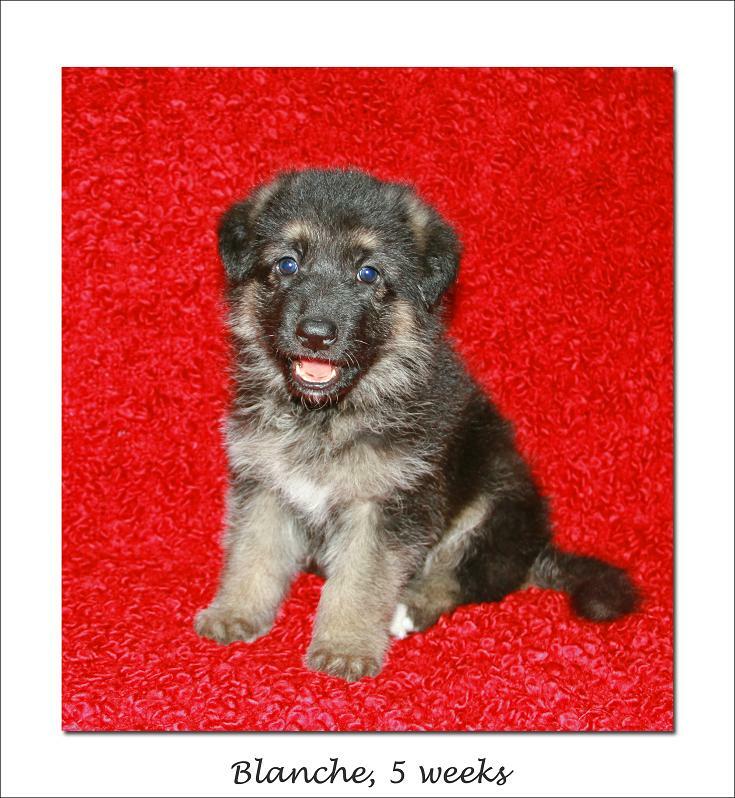 The adopting families will be getting a complete CD of pictures so they can see how their little furball developed for the first eight weeks of his or her life. As I said, I am doing this just the way I would want to be presented with a pup! 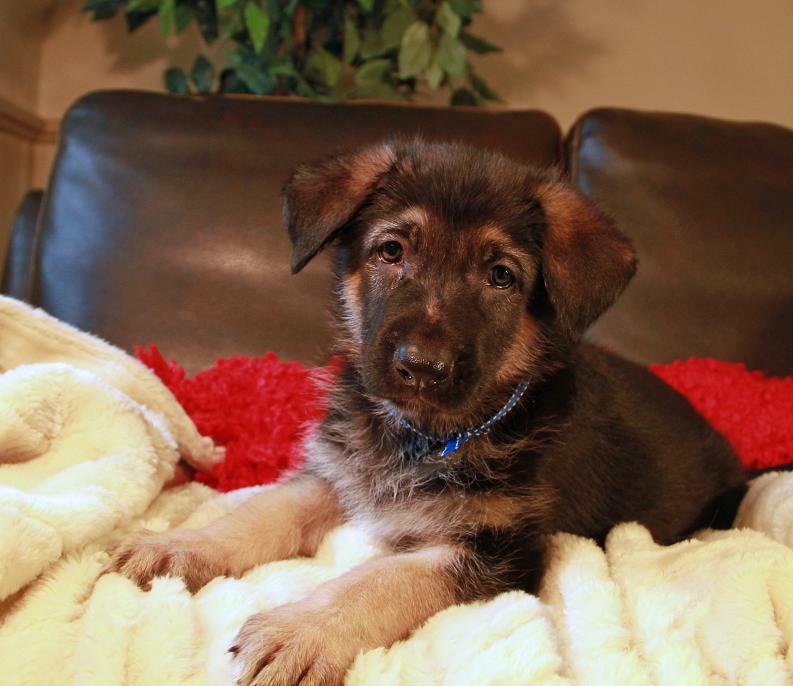 And certainly I would want plenty of early puppyhood photos…. And check out this last one. Not a great portrait or anything, but doesn’t it look like he’s saying, “I’m just about ready to go to my new home now!”? A note on ear taping, before I forget. 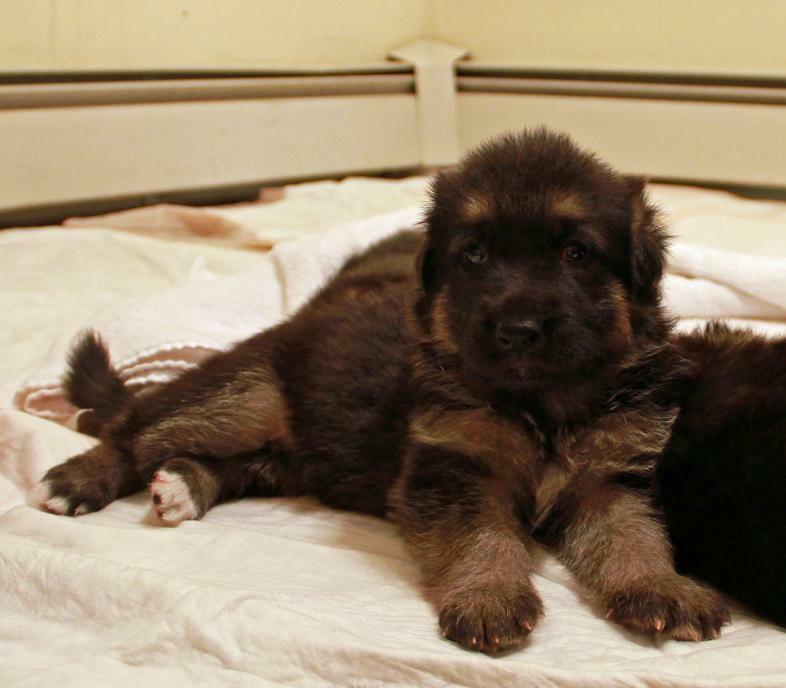 I believe that all of the families who will be adopting our puppies are reading this blog. 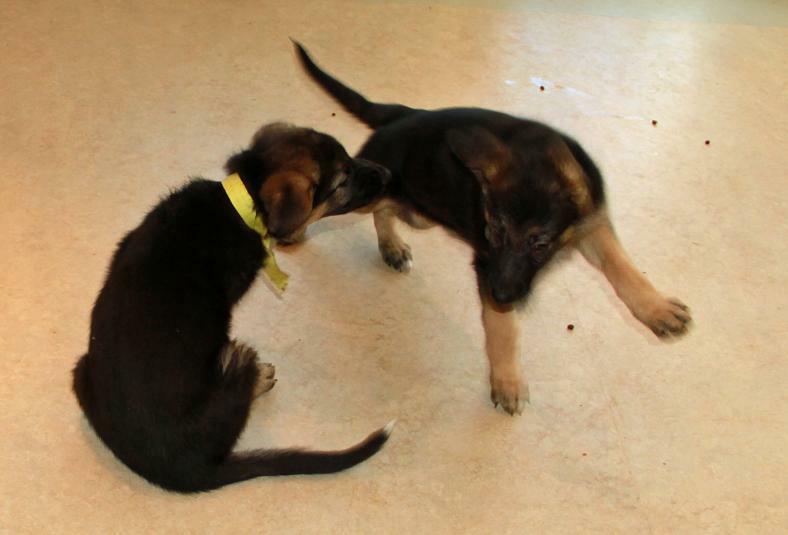 Here is one very important thing to know: both Sassy and Marcus, the puppies’ parents, needed their ears taped up when they were young pups, because they have wonderfully huge ears. 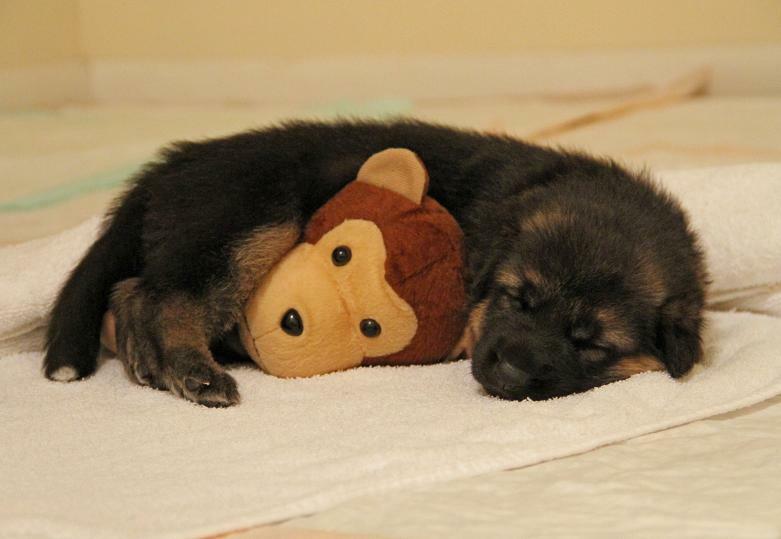 Many GSD pups need this done. You can read about why it is done, why it needs to be done, and how to do it here http://www.total-german-shepherd.com/GermanShepherdeartaping.html, but whatever you do, don’t try to do it yourself. 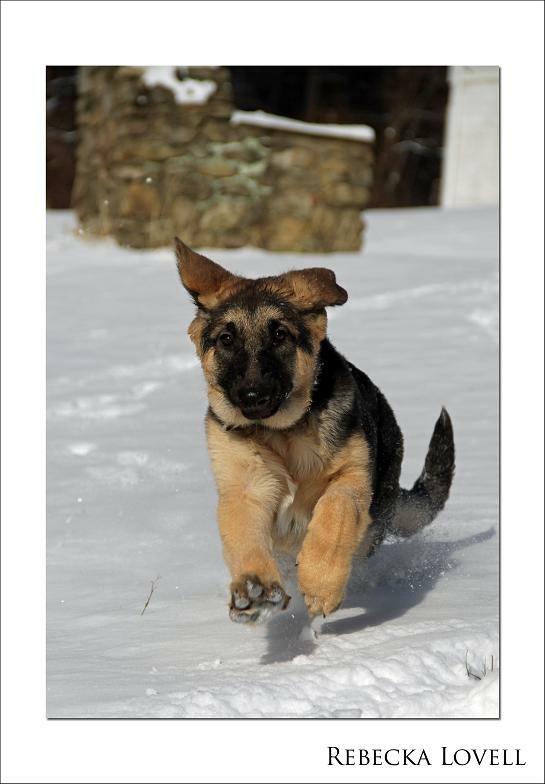 Please ask Jane, or ask a local, experienced GSD breeder if you don’t live in NJ. 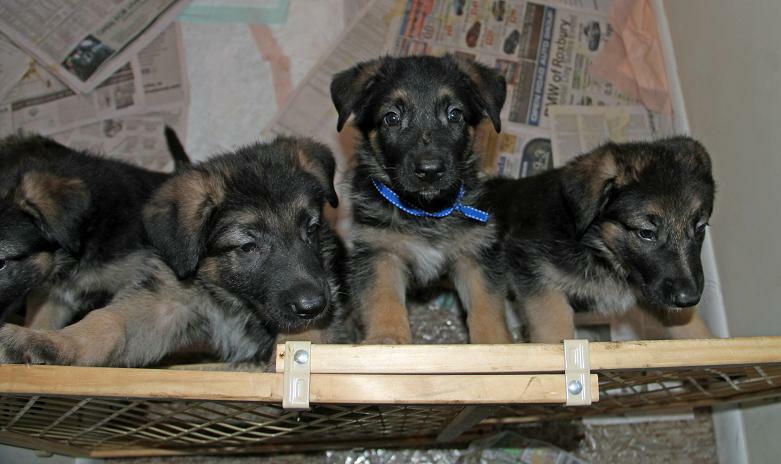 Q: How long does it take 2 adults to give 6, 7-week old puppies, 1 and a half tablets of medicine each? A: What, you had something better to do with your evening? There is not a bad one in the bunch. I stayed for a long time tonight after our work was done, and just played with them. I am already sad to see them go, and they’re still here! I guess I’m just preparing myself, but I really should be living in the moment. 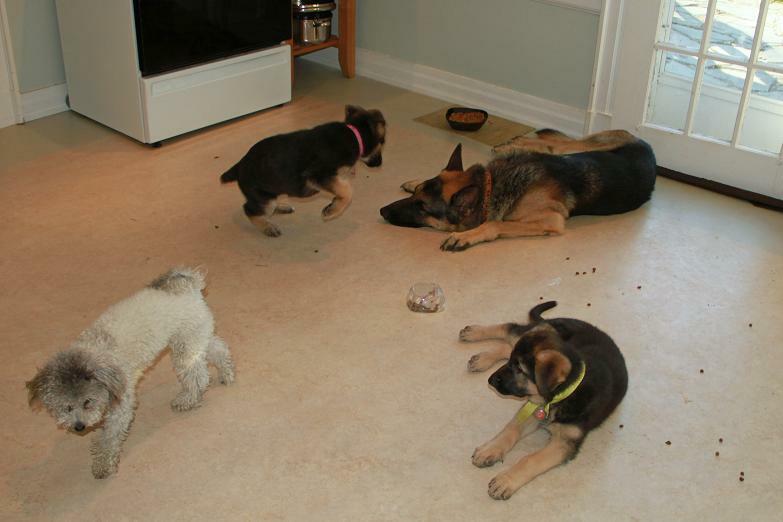 The pups have also been socialized with our Marcus and Iggy (to get them used to other dogs besides their mom). 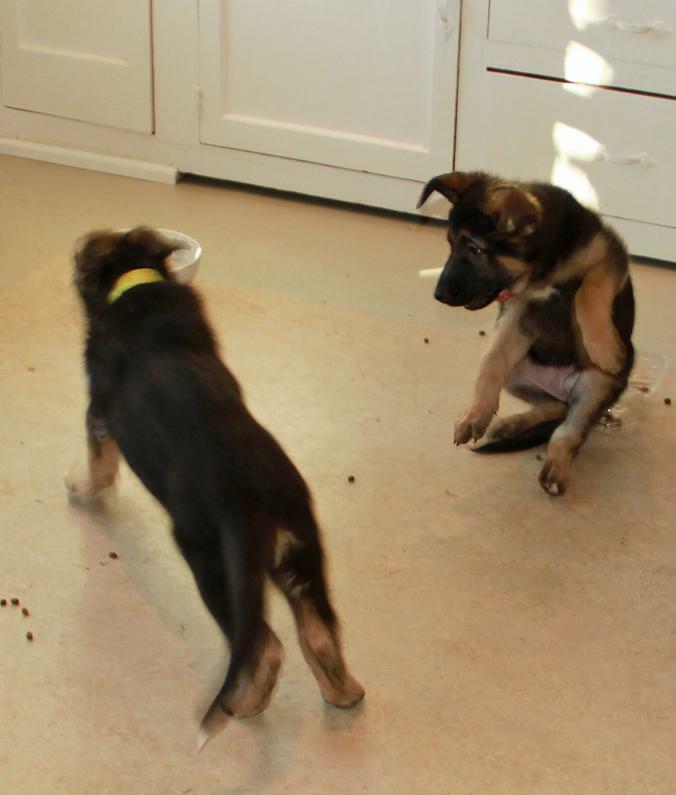 One by one, we have been taking them out of their playroom to give them “alone” time away from the litter. They have been allowed to explore our home (supervised, obviously), get used to another environment, and have even come nose-to-nose with a cat. Our friendly “Zen cat,” Tiki, was their introduction to the fascinating feline. So many people are coming to visit the puppies this weekend! Everyone who has met them wants to say good-bye. It’s wonderful to have so many visitors. Here are Ashlea and Haley who graciously agreed to have their photos taken with two of the pups. Lucky pups to be getting hugs from such pretty young ladies! 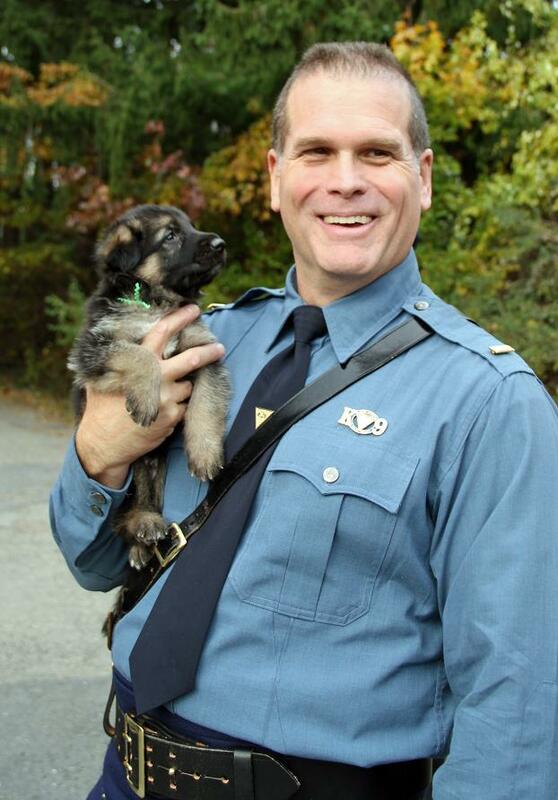 … we welcomed the new owners for four of the pups. Nikita (Blanche), Odie (Greenbean), Juni B. (Violet) and Bluebeard (not yet renamed) left our care, and were delivered into the warm, welcoming arms of their new families. Of course it was difficult for us to see them go, but it was made so much easier because we saw the joy in the eyes of the people taking their new puppies home. Thanks to Jane’s decades of experience, and our hands-on interaction and observation of the personalities of the pups, I know that the pups went to homes which were perfectly suited for each of them. Calm, loving Nikita is the latest addition to a family with two children, including a 3-year-old boy. Odie is off to Ohio, and will have a job! 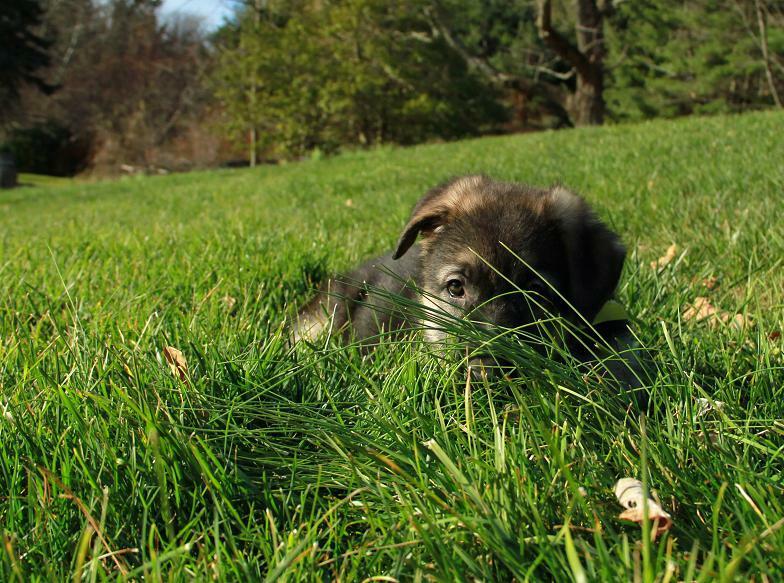 He will be the sidekick and best buddy of a landscaper, and has a large extended family to visit throughout the Northeast. 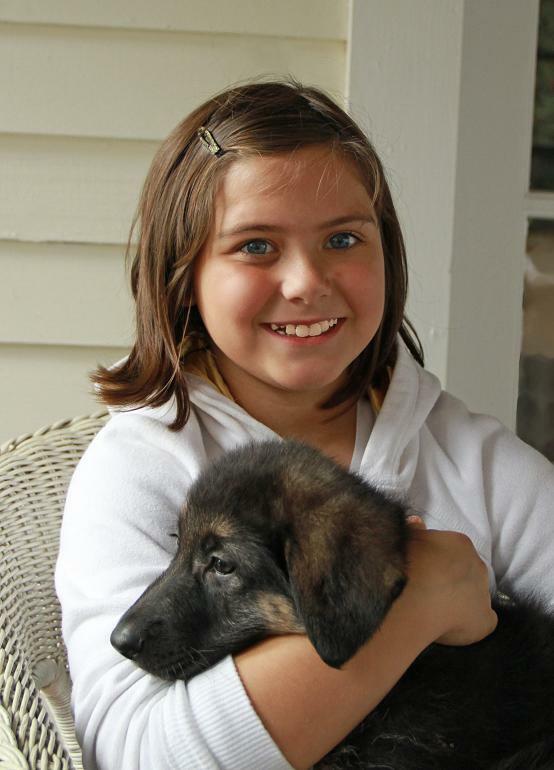 Juni B., our alpha female, is off to Piscattaway, where a 9-year-old girl came home from school to see her new little sister, who will grow up to offer not only love, but also protection. Bluebeard left for Brooklyn — where he would arrive as a surprise for another 9-year-old girl who lost her beloved German Shepherd to cancer recently. 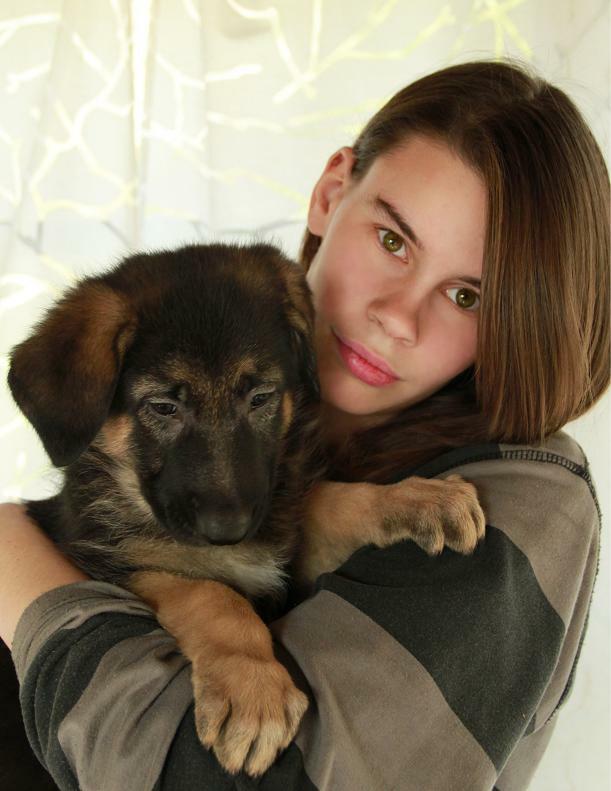 I am happy to say that I managed – although just barely – to save my tears until the last puppy left. Thank goodness we still have two here. Rosie whom we will keep or place in a home of a close friend, and Lemondrop, who is just a joy. 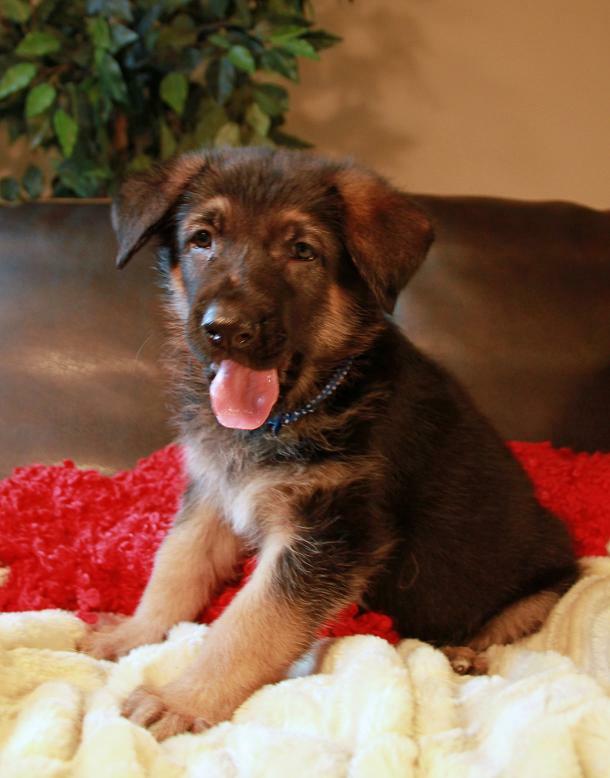 We are now integrating them into our family, and will start housebreaking them and training them together, until Lemon finds her new perfect home. Iggy is over the moon about this new turn of events. Rosie slept in our bed last night (we like to start in early with the bad habits, to make sure they are well ingrained), and Lemon decided she wanted to curl up with her daddy, Marcus, in his big bed. Both of them appeared to be in heaven. 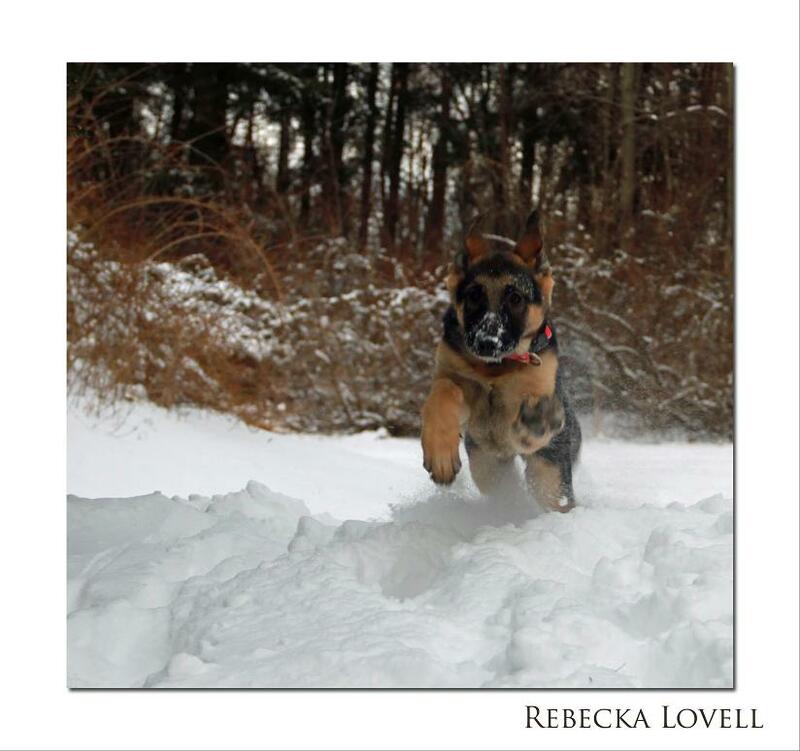 I will post pictures of the new families with their dogs as I get permission from each. Breakfast. Also known as Generalized Mayhem. And that’s just the first 45 minutes of our day. Following breakfast comes the broom, for obvious reasons. The puppies are on the fence as to whether Mr. Broom is a fabulous game or a horrible monster. 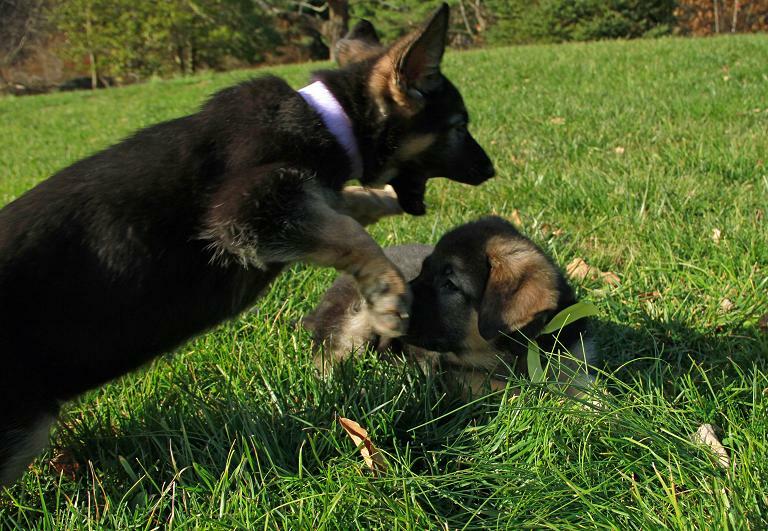 The puppies have just recently been introduced to the outdoors. Rosie and Goldie (we now call Lemondrop “Goldie” as we found her former moniker was too long to use) are still with us, and are now housetrained, crate trained, and understand a ton of commands. We are still looking for the perfect home for them. Here are some recent pics, and yes, they sure have grown. What good little puppies they are, too. 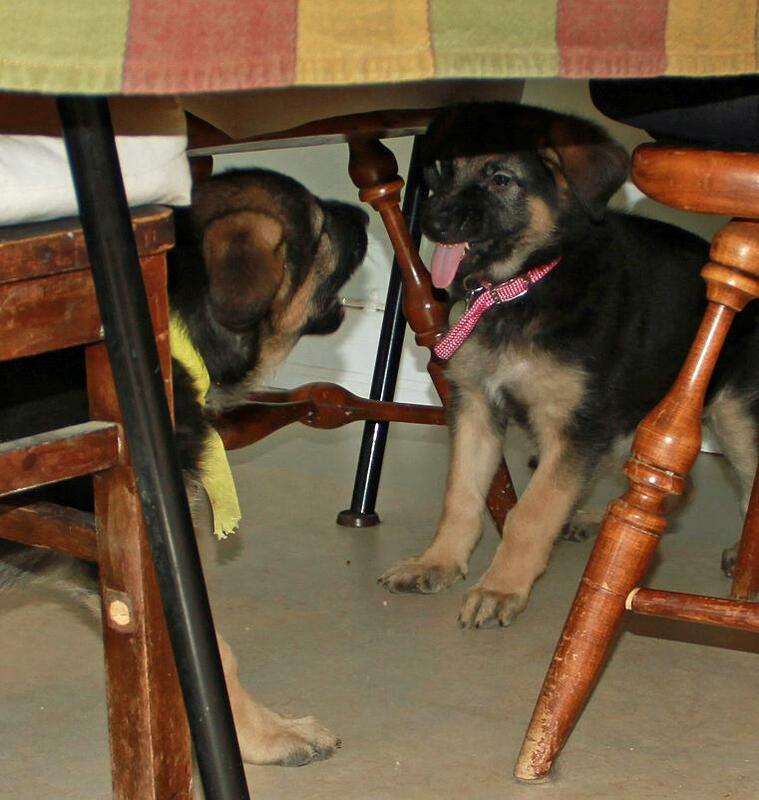 Both of the girls have found their forever homes! Our home seems so quiet. We will be expecting regular postcards from our babies! !